Twelve-year-old Doug discovers fixing up an old car is fun and educational. Under Gramps’ mentoring, he learns to repair problems. But the most important skill he gains is thinking. 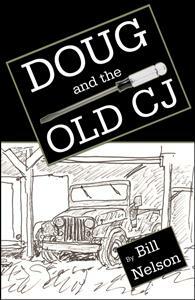 Twelve-year-old Doug finds a vintage Jeep in a barn. With the help of Gramps, he earns the money to buy it, gets it operational, and learns to drive it. After planning a route which avoids roads, he sets out on a long excursion to a country store. Once there, he shows of his car to an older boy. A snowplow is purchased and installed. Gramps shows him how to clear driveways. One stormy winter night, Doug gets a call from a stranded neighbor who is about to have a baby. He plows through the fields with his CJ and rescues her. My husband and I bought this book last month, and thoroughly enjoyed it. We have rebuilt a '64 Corvair twice, and know the effort that entails. Bill's book is wonderful, especially for young boys who have a yen for working with their hands. It would be perfect for building a relationship between them and experienced adults. In today's society, so much effort is centered around the electronic age, that we've forgotten about the joys of working with your hands and mind on a mechanical problem. This book appeals to that talent.